What is a Community Flood Warden? Community Flood Wardens are members of the local community and are supported by the Local Authorities, the Environment Agency and LLR Prepared. Nominated volunteers will sign up with their District Council and become part of the Community Flood Plan for their area. They will also receive direct flood warnings from the Environment Agency and pass these on to their neighbours. 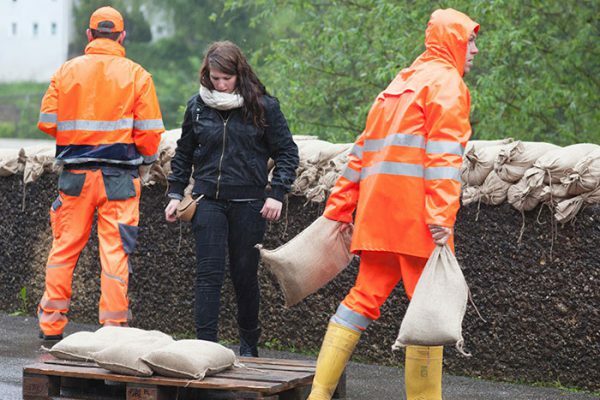 The number of Community Flood Wardens will depend on the size of the community – a single individual may cover one street, connecting streets or even the whole community. Why do we need Community Flood Wardens? Since the year 2000, a large number of communities have been affected by some of the worst flooding for 50 years, and have been forced to confront the devastating consequences that flooding can bring. Flooding is a natural process and whilst it cannot be prevented, there are things we can do to prepare for a flood event. Although the Environment Agency issue warnings for most main rivers and the coast, it is important for individuals and local communities to understand that they also have a responsibility to look after themselves, their families and properties by preparing for flooding. Flooding can be made worse by blocked drains and other obstructions – by monitoring and reporting such conditions to the appropriate authority, flood wardens can help to reduce potential problems. There are a number of Community Flood Wardens operating within Leicester, Leicestershire and Rutland, and many advantages have already been gained. They help to bring the community together during difficult times and by working together with the Environment Agency, Local Authorities and the Emergency Services, the impact of flooding can be reduced. What is the role of a Community Flood Warden? Each Community Flood Warden will have a certain area that he/she will look after, and by working together with the Local Authority and the Environment Agency, ensure their community is prepared for flooding. Support and training will be provided, along with assistance with the production of a Community Flood Plan. They should always call the emergency services or the relevant agency to deal with such situations. How can I become a Community Flood Warden? Although there are around 100 Volunteer Community Flood Wardens already operating in the area, we need to recruit and train more to ensure that we can effectively cover the City, County and Rutland.